British-israel.us -- Was Joseph A Type Of Christ? Genesis chapter 37 Star Chart: Clockwise from when Joseph (Orion) was "seventeen years old" (In 1683 B.C. -- cp. Gen. 29:22) and "feeding the (Taurus-Aries) flock" (37:2) (with solar golden grain) and dreamed "the sun and the moon and the eleven stars made obeisance" to him (37:9) (rotated down the horizon) till his brothers (Auriga, Gemini, Perseus, etc.) "lifted up Joseph (Orion) (with red radius rope) out of the (black lunar) pit, and sold Joseph to the Ishmeelites for twenty pieces of silver (twenty revolutions of silvery moon): and they brought Joseph into Egypt" (37:28) is 20° days. 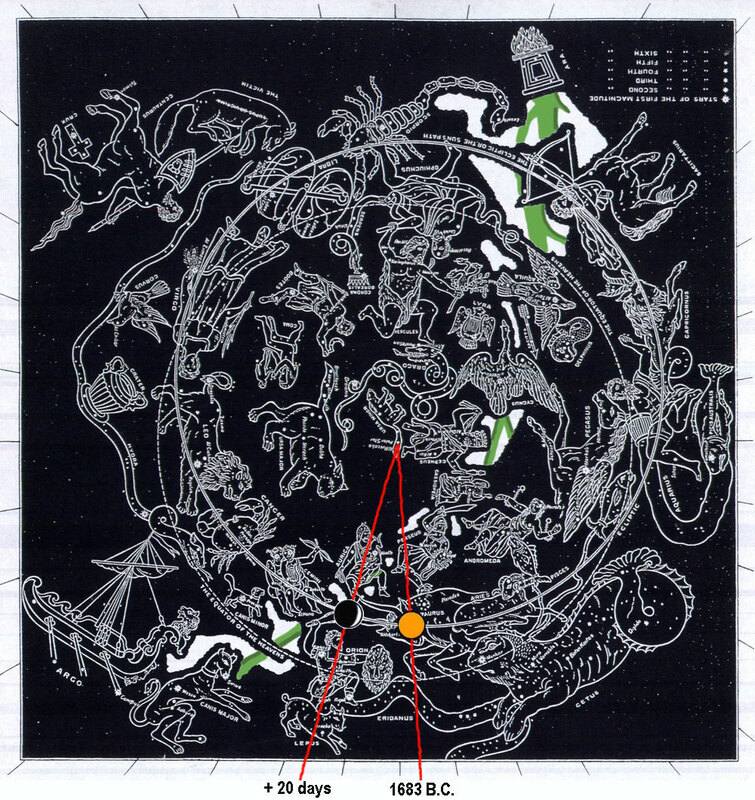 Notice Joseph's red radius sheaf (in Taurus) standing "upright" (37:7) while his eleven brothers' constellations rotated down the horizon (bowed) around him. 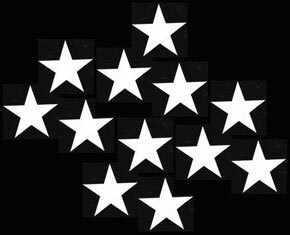 Yes, "the sun (Jacob) and the moon (Leah) and the eleven stars (sons) made obeisance to me" (37:9). Joseph's brethren fulfil his dream without realizing it by bowing before him (42:6). The Lord revealed His plan and purpose to him in dreams (Amos 3:7). God "called down famine on the land ... and he sent a man before them - Joseph, sold as a slave" (Psa 105:16-17). Joseph’s two dreams marked the certainty that the things he dreamed of would actually happen (Gen 41:32). Was Joseph A Type Of Christ? 37:1 And Jacob (Auriga) dwelt in the land wherein his father was a stranger, in the land of Canaan. 2 These are the generations of Jacob. Joseph (Auriga), being seventeen years old, was feeding the (Taurus-Aries) flock with his (Orion, Perseus and Gemini) brethren; and the lad was with the (Gemini) sons of Bilhah, and with the (Gemini) sons of Zilpah, his father's (Gemini) wives: and Joseph (Auriga) brought unto his father their evil report. 3 Now Israel (Orion) loved Joseph (Auriga) more than all his (Gemini, Perseus, etc.) children, because he was the son of his old age: and he made him a coat of many colours (Auriga's white, green, red and black coat). 4 And when his (Orion, Perseus and Gemini) brethren saw that their father (Auriga) loved him more than all his (Gemini) brethren, they hated him, and could not speak peaceably unto him. 5 And Joseph (Orion) dreamed a dream, and he told it his (Auriga, Perseus and Gemini) brethren: and they hated him yet the more. 7 For, behold, we were binding sheaves in the field, and, lo, my (red radius) sheaf arose, and also stood upright; and, behold, your sheaves (star constellations) stood round about, and made obeisance to my sheaf (rotated down to horizon -- bowed). Joseph's sheaf is interpreted of the Messiah, whom they call the son of Ephraim. 8 And his (Auriga, Perseus and Gemini) brethren said to him, Shalt thou indeed reign over us? or shalt thou indeed have dominion over us? And they hated him yet the more for his dreams, and for his words. 9 And he dreamed yet another dream, and told it his (Auriga, Perseus and Gemini) brethren, and said, Behold, I have dreamed a dream more; and, behold, the sun and the moon and the eleven stars made obeisance to me. 10 And he told it to his father (Auriga), and to his (Perseus and Gemini) brethren: and his father rebuked him, and said unto him, What is this dream that thou hast dreamed? Shall I and thy mother and thy (Perseus and Gemini) brethren indeed come to bow down ourselves to thee to the earth? 11 And his (Perseus and Gemini) brethren envied him; but his father (Auriga) observed the saying. 12 And his (Perseus and Gemini) brethren went to feed their father's (Taurus-Aries) flock in Shechem. 13 And Israel (Orion) said unto Joseph (Auriga), Do not thy (Perseus and Gemini) brethren feed the (Taurus-Aries) flock in Shechem? come, and I will send thee unto them. And he said to him, Here am I. 14 And he said to him, Go, I pray thee, see whether it be well with thy (Orion, Perseus and Gemini) brethren, and well with the (Taurus-Aries) flocks; and bring me word again. So he sent him out of the vale of Hebron, and he came to Shechem. 15 And a certain man (Orion) found him, and, behold, he was wandering in the field: and the man asked him, saying, What seekest thou? 16 And he said, I seek my (Perseus and Gemini) brethren: tell me, I pray thee, where they feed their (Taurus-Aries) flocks. 17 And the man (Orion) said, They are departed hence; for I heard them say, Let us go to Dothan. And Joseph (Orion) went after his (Perseus and Gemini) brethren, and found them in Dothan. 20 Come now therefore, and let us slay him, and cast him into some (lunar black) pit, and we will say, Some evil beast hath devoured him: and we shall see what will become of his dreams. 21 And Reuben (Auriga) heard it, and he delivered him out of their hands; and said, Let us not kill him. 22 And Reuben (Orion) said unto them, Shed no blood, but cast him into this (lunar black) pit that is in the wilderness, and lay no hand upon him; that he might rid him out of their hands, to deliver him to his father again. 24 And they took him, and cast him into a (lunar black) pit: and the pit was empty, there was no water in it. 25 And they sat down to eat (solar golden) bread: and they lifted up their eyes and (red radius) looked, and, behold, a company of Ishmeelites came from Gilead with their (Taurus) camels bearing (solar golden) spicery and balm and myrrh, going to carry it down to Egypt. 26 And Judah (Orion) said unto his brethren, What profit is it if we slay our brother, and conceal his (red radius) blood? 27 Come, and let us sell him to the (Gemini) Ishmeelites, and let not our hand be upon him; for he is our brother and our flesh. And his (Perseus and Gemini) brethren were content. 28 Then there passed by (Gemini) Midianites merchantmen; and they drew and lifted up Joseph out of the (lunar black) pit, and sold Joseph to the Ishmeelites for twenty pieces of silver (silvery moon rotates twenty times -- twenty days): and they brought Joseph (Auriga) into Egypt. i.e. shekels, as Genesis 20:16. In Leviticus 27:5; Leviticus 27:20 shekels is the price for a slave between the ages of 5 and 20. 30 shekels is the price for a slave in Exodus 21:32. On the value of a shekel, see Genesis 23:15. 29 And Reuben (Orion) returned unto the (lunar black) pit; and, behold, Joseph (Auriga) was not in the pit; and he rent his clothes. 30 And he returned unto his (Perseus and Gemini) brethren, and said, The child is not; and I, whither shall I go? 32 And they sent the coat of many colours, and they brought it to their father (Auriga); and said, This have we found: know now whether it be thy son's coat or no. 33 And he knew it, and said, It is my son's coat; an evil beast hath devoured him; Joseph (Auriga) is without doubt rent in pieces. 34 And Jacob (Auriga) rent his clothes, and put (black Zodiac) sackcloth upon his loins, and mourned for his son many days. 35 And all his (Orion, Perseus and Gemini) sons and all his (Gemini) daughters rose up to comfort him; but he refused to be comforted; and he said, For I will go down into the grave unto my son mourning. Thus his father (Auriga) wept for him. 36 And the (Gemini) Midianites sold him into Egypt unto (Auriga) Potiphar, an officer of Pharaoh's, and captain of the guard. 1. Joseph was the beloved son of his father (see Genesis 37:3). So was Jesus. Both were put "above thy fellows" (Heb. 1:9; Matt. 3:17). Jesus and Joseph were faithful to their respective fathers hence the hatred of the other sons. Both did the will of him who sent him. 2. Joseph was a good shepherd (37:3), a type of Christ, the Good Shepherd. 3. He visited his brothers to "See whether it be well with thy brethren, and well with the flocks; and bring me word again" (37:14). Christ was sent to the shepherds and the sheep of Israel. This accounts for the special effort he made to appeal to the Jewish religious leaders, even when it seemed he was wasting time with them. 5. He was cast into a pit with no water in it (37:24) just as Christ was cast into a grave (Zech. 9:11; Ps. 69:15). Spices are involved with Joseph and Christ. (37:28). 7. Judah proposed the sale of Joseph. Judas (the Greek spelling of Judah ) was the one who actually sold Jesus. (See Genesis 37:26 ; Matthew 27:3) Certain leaders of the Jews in Jesus’ day turned Jesus over to the Romans. 9. In their very attempt to destroy Joseph, his brothers actually set up the conditions that would bring about their eventual physical salvation. Joseph, by virtue of being sold, would become their deliverer. Jesus, by His being given into the hands of the Gentiles, was crucified and thereby completed the atoning sacrifice, becoming the Deliverer for all mankind. 15. One of his persecutors tried to save him at the last minute (37:21); so did Nicodemus and Pilate. At least 2 of his 10 persecutors were unhappy about what they were doing , and said so (37:22,26). Perhaps the whole group egged each other on to adopt an attitude none were totally happy with in their conscience. 16. " They stript Joseph out of his coat" (37:23); was Joseph naked in the pit? Same LXX word in Mt. 27:28; was Christ naked on the cross? See Heb. 6:6 "open shame". They parted our Lord's garments. The coat of many colours (KJV) is translated differently in other versions. For example, the NRSV and NEB describe it as a long robe with sleeves, while the NIV says it was a richly ornamented robe. A favoured person, in the Near East, would be adorned with a garment made from patches of different colored cloth. This distinct garment would mark that person as special. Joseph was favoured above his brethren by Jacob, and he showed it publicly by wearing that brightly colored robe. Virgin daughters of kings were also adorned with such robes for distinction (2 Sam 13:18). The phrase divers colours (KJV) comes from the Hebrew word pas. It is the same word that is translated colours here in v.3. 17. A blood drenched coat in both men's lives (Is. 63:2; Rev. 19:13)." Joseph is...rent in pieces. When Jacob saw Joseph's blood drenched torn coat, he rent his clothes" (37:33,34); Jacob shared in Joseph's death. This is a fine prefigurement of the (sadly ignored) pain of God. Joseph being reckoned as dead by his father, and yet alive, may be herein an emblem of Christ's death, and his resurrection from the dead. 18. Symbolically killed by the shepherds of his father's flock (37:12). Christ killed by the Jewish priests, the shepherds of God's flock.
" When the husbandmen saw the son, they said among themselves (i.e. conspired), This is the heir; come, let us kill him" (Mt. 21:38). Mt. 21:38 is quoting the LXX of Gen. 37:18. 20. But not a bone of Joseph (or Jesus) was broken (39:17-20). 21. Judah disgraced after the condemnation of Joseph (Gen. 38). The same is true for Judah as a nation after their rejection of Christ. 22. Potiphar means dedicated to Ra (the sun god). He was a native Egyptian in the employ of the Hyksos kings who now ruled Egypt. He was Pharaoh's chief guard. While being part of the army, Potiphar took care of civil duties as chief of police, head executioner etc. His master committed all that he had into his hand (39:8). Potiphar: Joseph relationship reflects that between God and Christ. In 39:9-10: Potiphar's wife spoke to and pressured Joseph 'day by day'. Lot was vexed 'day by day' also (2Pet 2:7-8). Here Joseph is example of how to deal with the ways of the world, in contrast to Lot. After v10 we have Joseph's action, in verses 12,13,15,18 of this chapter ten times it uses the phrases 'he left', 'and fled', 'got him out'. Paul exhorts us to be of the same mind: "Flee fornication" (1Cor 6:18)., "flee from idolatry" (1Cor 10:14), "the love of money ... flee" (1Tim 6:11), "Flee also youthful lusts" (2Tim 2:22). So many aspects of human weakness were tested in Joseph: pride with his brothers, lust with women, bitterness in prison, the meteoric rise to success in a career, the glamour and glory of the high life. Our Lord Jesus likewise went through it all -- absolutely all for our sakes. Jesus is our best example, who committed no sin (1 Peter 2:22) and knew no sin (2 Corinthians 5:21). He has been tempted in all things as we are, yet without sin (Hebrews 4:15). 23. Falsely accused of adultery, but with no defense on his part (39:18-20). Then cast into prison. Christ also silent (dumb) before his false accusers. (prison -- death; the ideas of prison and darkness are often associated (e.g. Is. 49:9). There was darkness at the death of Christ). He wrongly suffered (1Cor 6:7; 1Pet 2:23). Joseph was innocent (40:15), like Jesus. Joseph in prison was typical of Christ's death. Ps. 105:17-23 says: " He (God) sent a man before them, even Joseph, who was sold for a servant; whose feet they hurt with fetters; he was laid in iron: until the time that his word came." On the cross, Christ's feet were hurt with an iron nail. Christ on the cross was the great, supreme prisoner. Like Joseph, He went through all the emotions of the prisoner; the shame, depression, introspection. 24. Joseph lost his garment before he went into the pit and before he went to prison (39:13) Jn. 19:23 says, "Then the soldiers, when they had crucified Jesus, took his garments, and made four parts, to every soldier a part; and also his coat: now the coat was without seam, woven from the top throughout." 25. In prison with two malefactors (one good and one bad?) Christ on the cross with two thieves (one good, one bad) The good one asked in each case: "Remember me when it shall be well with thee" (40:14) and "he said unto Jesus, Lord, remember me when thou comest into thy kingdom" (Luke 23:42). The cupbearer and baker are like the bread and wine by which we remember Christ's sacrifice (40:8). The Crucifixion is foreshadowed by 3 days till you hang on a tree and die (40:13,19) - one body, the fleshly one, dies; another body, the spiritual one, lives and is rewarded. 26. In Genesis 41:1,14 - Two full years after suffering with two thieves in the jail Joseph returns to Egyptian civilization just as after 2000 years Christ suffers with two criminals he returns in a second coming. The men concerned with bread and wine were freed Gen 40:20-22, but it was to be another two years before Joseph gained his freedom Gen 41:1. The process whereby we obtain our freedom has already started and we celebrate the fact with bread and wine. We don't yet have that freedom, but it will surely come, if we wait patiently as Joseph obviously did. In the meantime, we must be careful that we don't act as the butler did, and forget what has been done for us. Every time he poured out Pharaoh's wine, the butler should have remembered the means whereby he gained his salvation and who provided that means. "This do in remembrance of me." When Jesus returns, the sons of Israel will once again realise that the man they tried to kill is alive and has become ruler over all. 27. "They made him run hastily out of the dungeon...and changed his raiment" (41:14). In the same way, Christ was resurrected from the grave in an instant; a change of clothing is a change of nature (Zech. 3:3,4). The news that Joseph was alive and glorified was received rather like that of Christ's resurrection: initial disbelief, but then a belief. 27. "The Lord...gave him favour in the sight of the keeper of the prison" (39:21) just as Christ increased in favour with God and man (Lk. 2:52). 28. Great pain in Joseph's heart because he knew his innocence (40:15); therefore the shame of a righteous man suffering as a sinner. Even more so with Christ who knew no sin and yet was put to open shame on a cross after being beaten with stripes. The shame of Joseph in the dungeon (40:15); the lowest of the low, according to Ex. 12:29. A type of the supreme degradation of Christ on the cross. An eloquent echo of Christ's relationship with us? 31. " According unto thy word shall all my people (Egypt) be ruled" (41:40). This is also true of Christ's word. Obedience to the Bible is a prerequisite to salvation. God's attitude to Christ. "According unto thy word shall all the people be ruled" (41:40) suggests complete trust. 33. " I have set thee over all the land of Egypt" (41:41) is like Christ who is given all power in heaven and earth (Mt. 28:18). All Egypt ruled by his word, therefore 'Egypt' is the church now, and also the future Kingdom. 41:40 - Joseph made number two in the land just as Christ is number two to God. 34. " Bow the knee" (41:43; 42:6). "As I live, saith the Lord, every knee shall bow to me, and every tongue shall confess to God" (Rom. 14:11). 35. Bread laid up in preparation for the famine is like Laying up the word ("bread of life") as a foundation against the judgment (1 Tim. 6:19). Making the Bible a part of your life. Living the Biblical way of life. 36. Given a new name: " Zaphnath-paaneah" : 'Saviour of the world', or 'bread of life.' Christ is both of these. He was given a new name on ascension (Phil. 2:6-9; Rev. 3:12).Joseph was of the seed of Abraham, in whom the promises of fruitfulness and blessing upon all nations were fulfilled (47:27; 46:3 cp. 12:2; Dt. 26:5; Ps. 105:23,24). Jesus was also of the seed of Abraham, in whom the promises of fruitfulness and blessing upon all nations were fulfilled. 38. "Joseph went out over all the land of Egypt" (41:45). Christ is also actively involved in our working out of our salvation. 39. Just as all of Joseph's brothers are blind to his identity, so also Christians know that Jesus is the Messiah, but they are blinded to the fact that they are his brothers hereditarily as the "Lost Ten Tribes." Jews know that they are Israelites in the hereditary sense, but are blinded to the fact that Jesus is the Messiah (Jn. 6:36; 9:41; 15:24 cp. 14:7). They all are bowing before Christ in some way or other. With regard to our Lord, even the apostles didn't recognize him after the resurrection initially. 40. Joseph wept (42:24). Jesus wept (John 11:35). He was a man of sorrows and acquainted with grief. 41. Joseph celebrates their repentance with a meal together, at which they sit in their proper places (43:16) typifying the marriage supper of the lamb, with each in his proper place (Lk. 14:10; 22:30; Rev. 19:9) " Slay and make ready" (43:16) for the meal. This is the basis of the prodigal son parable (45:14,15 = Lk. 15:20); father = Christ; prodigal = repentant Jews and Christians, wanting to be servants and nothing else. 42. Joseph's cup is how he discerns (44:5).The cup of the Lord likewise. 43. "Then Joseph could not refrain himself..." (45:1) implies he planned to drag out the process of spiritually refining his brothers, but his love for them caused him to cut it short." For the elects sake the days shall be shortened" by Christ (Mt. 24:22). The same Hebrew word is used in Isa. 42:14 about how God can no longer refrain Himself in the last days. Gen. 42:8 Why did they not recognize him? He was dressed like an Egyptian. We teach today a Jesus dressed like a Greek so his brethren, the Jews, don't recognize him. He knew them but they knew him not. Messiah is not recognized by Jews today. See my face (Yom Kippur). When Judah repented, Joseph revealed himself. Christ will reveal himself when Judah repents also. Gen. 45:1-6 no man with him = Yom Kippur event.